The base game is quite standard, and runs on regular European Blackjack rules. The dealer will stand on all 17s, hard or soft. Players can split once. Aces may be split, but each can only take one additional card after the split. The minimum wager in the game is 1 credit, and the max is 200. With 8 chip sizes, it is easy to bet the right amount. The game has two payout schedules: one for the main game, and one for the side bet. The main game pays a standard 3:2 for blackjack, 1:1 for a regular win, and 2:1 on insurance bets. The game window consists of a smooth green felt table surrounded by a polished wood rim, and a black leather cushion for players to rest their elbows on. A brass chip tray is set into the table near the dealer, and to the right, a crystal-clear card shoe displays two decks of crisp playing cards. The realism achieved in this game is uncanny, and is complimented by smooth, intuitive gameplay that only Microgaming can deliver. Basic strategy applies to the base game here, but the side bet takes a little extra thought. It’s definitely a gamble – the payouts can be huge, but the chances of being dealt a Mixed Pair, let alone a Perfect Pair, are not that great. Because the deck is shuffled after each hand, there’s no way to count, so each new bet has the same odds. But in the end, that’s the fun of it – a little dash of pure, luck-based gambling in a raw, skill-based blackjack game makes for a Perfect Pair! Perfect Pairs European Blackjack is a solid blackjack game with a well-paying side bet that pays out well in the long run. Impatient players might get frustrated when the side bet loses many hands in a row, but when it does hit, it definitely makes up for it! 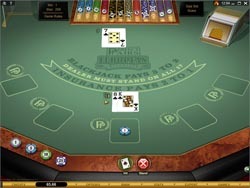 This is yet another great blackjack game from the labs at Microgaming, and it’s not one to be missed.